We recommend using the Java Runtime Environment (JRE) version that is delivered with the latest Oxygen package. Check our compatibility guide if you want to know if Acrolinx for Oxygen works with your local platform and with your Acrolinx platform. You can use the Sidebar with Author and Text views. And we don't support Grid and Table views. How can I install, update or uninstall Acrolinx for Oxygen? If you use Oxygen Eclipse with a CMS such as Ixiasoft, Acrolinx provides a dropin package that you can install just like any other dropin. Get the Acrolinx for Oxygen dropin from your company download area. Select Help > Install New Software... from the menu. Select Acrolinx for Oxygen Eclipse . Select Help > Manage add-ons... from the menu. Select Acrolinx for Oxygen and click Update . Select Acrolinx for Oxygen and click Uninstall . To show the Sidebar, click in your Oxygen toolbar. 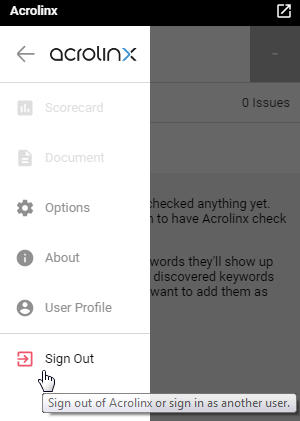 Or select Acrolinx > Show Sidebar from the menu. The Sidebar in Eclipse appears in the same language as your operating system, as long as it's an Acrolinx supported language. Acrolinx supports English (en), German (de), French (fr), Japanese (ja) and Swedish (sv) languages. Acrolinx checks all the content from the supported file types mentioned above. However, you can extend what Acrolinx checks by configuring your Acrolinx Server. You might want to ask your Acrolinx administrator to do this since it can be a little tricky. See What does my Acrolinx Administrator need to do? below. You can also check an entire DITA map with the Sidebar. You'll see a light version of the Sidebar. This means that Acrolinx doesn't highlight issues or replace issues for you. But you can edit your issues directly and use all the other features of the Sidebar. Check selection is available in both Text and Author mode, however, we recommend that you use check selection in Text mode. Acrolinx saves check data in your documents if your Acrolinx administrator enables Embed Check Data on your Acrolinx Core Platform. You'll find the data at the end of your document. To learn more about activating and using the Embed Check Data function, see our article on Embed Check Data for Sidebar Edition Integrations. Extend the file types that you can use with Acrolinx for Oxygen. To learn how to activate the Embed Check Data function, see our article on Embed Check Data for Sidebar Edition Integrations. Presetting the Acrolinx Server address only works the first time you install Acrolinx for Oxygen. After that, Acrolinx for Oxygen will always use the last server address.